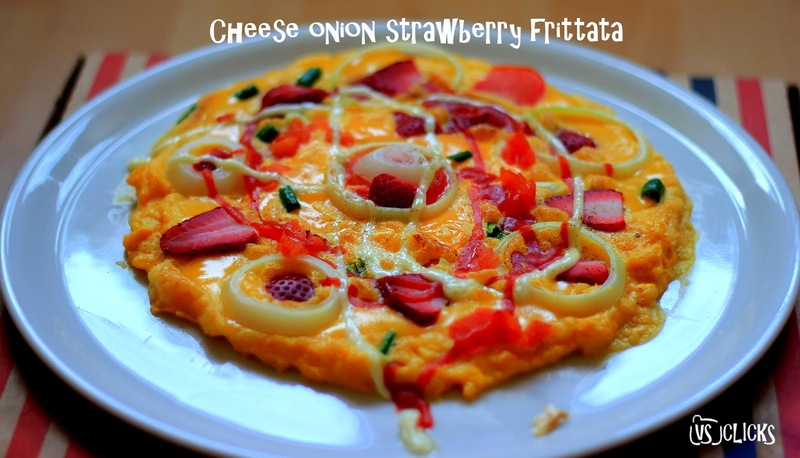 Vinayaka's Kitchen: Cheese onion strawberry frittata - How-to? 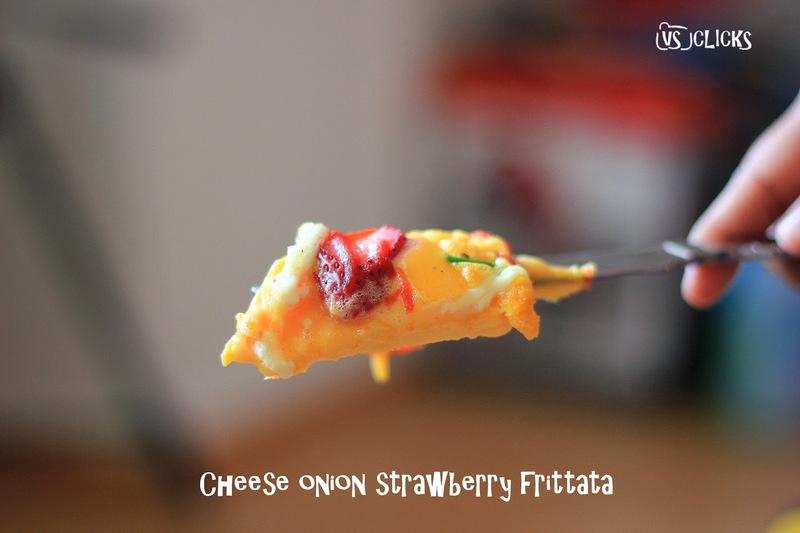 Cheese onion strawberry frittata - How-to? 1. Take 6 eggs and crack the eggs into a bowl. Add 3 pinch of salt and 1 pinch of Turmeric powder to it. 2. Beat the egg until they turn pale yellow color generating bubbles. Keep it aside. Slice a tomato into three or four pieces and cut one onion into two or three pieces (8 - 9 rings), preferably rings of smaller size. Cut strawberry into small slices and cut green chillies into small pieces after removing the seeds. 3. Heat up the pan first in low flame and then spread 2 tbsp of butter over it. Pour in the beaten egg into a round shape and cook it briefly. Make sure the top is still juicy and the bottom is yellow in color. 5. Transfer it to a plate. Then place the cheese (sliced) on the edges of the omelette and the other in the center. Place the onion rings and tomatoes alternatively. Add green chillies here and there and decorate it with strawberry. Finally, spray tomato ketchup and mayonnaise to make it colorful. Pre-heat oven at 200 for three minutes, then place the plate inside the oven for six to eight minutes. 6. Remove the plate carefully from oven and serve it hot. #DoYouKnow: Cheese onion strawberry frittata is an Italian dish made with beaten eggs, onions and green chiillies. It's easy to cook sweet and tastes heavenly. Note: This dish was certified by my hubby and was given 10 out 10 marks by him. Try it out and you are welcome to post the pics here. Thank you for visiting Vinayaka’s Kitchen. You can like our kitchen on Facebook, follow our kitchen on Google+, download our android app or connect with me on Google+ or subscribe to our feeds to get notifications of our latest recipes. Sure di...will share my experience and pics as soon as I try it.